honey & jam | recipes + photos: Another Banana Recipe? Yes. Coco-Nana Bread. Another Banana Recipe? Yes. Coco-Nana Bread. Let’s start at the beginning, although I found this recipe disappointing, I actually really enjoyed the process of making this. I don’t mind sifting, and there’s a lot of it in this recipe, and there is just something about smashing bananas that is so satisfying. When I first cut off a piece of this, it tasted absolutely disgusting, I was ready to write a scathing review, and possibly call Dorie Greenspan absolutely crazy for putting this in her book (forgive me!). 20 minutes later, I tried it again and it seemed like the taste had completely changed. I know some things get better the longer they are left to sit, but I’ve never seen anything this drastic. The taste was...disappointing is the best word for it. It wasn’t bad per se, but it just wasn’t that good. I could hardly taste the bananas, and it just seemed to taste of chocolate that wasn’t sweet enough, if that makes sense. I won’t be making this one again, but it was a fun experience. Working with a stand mixer, preferably fitted with a paddle attachment, or with a hand mixer in a large bowl, beat the butter at medium speed for about a minute, until softened. Add the sugars and beat for 2 minutes more. Add the eggs one at a time, beating for a minute after each addition. At this point, the batter may look a little curdled -- it's okay. Reduce the mixer speed to low and mix in the mashed bananas. Add the dry ingredients in 3 additions, mixing only until they disappear into the batter. Still on low speed, add the buttermilk, mixing until it is incorporated. 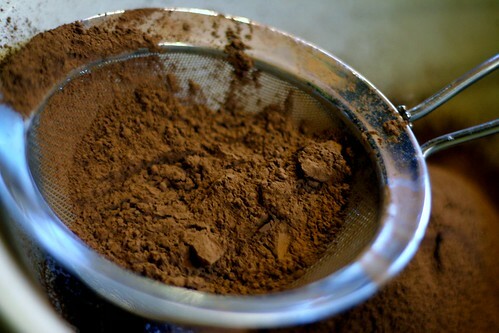 Stir in the chopped chocolate. Scrape the batter into the pan. It's so weird that you didn't like this recipe! There are tons of others who tried this one and loved it. I guess to each her own, right? Maybe the amount of cocoa powder was too much. You could try using melted chocolate next time. You won't get that strong cocoa flavor. i spot some target goods! hehe.. i have that apron pattern at home! I loved it Hannah. I think after it cooled off it was good! I would definitly make this again! dang! i hate when that happens and chocolate w/ bananas is such a great combination usually...sorry it was a disappointment. Lovely blog. I like baking too, but my photography skills aren't as good as yours. Thanks for your honest comment about not being wild about this recipe. Actually it looks like an excellent recipe...if you like bananas. I'm weird. I cannot abide bananas, but I make banana bread for the family sometimes. Hmmm definitely couldn't tell from the picture! Looks so moist and yummy. 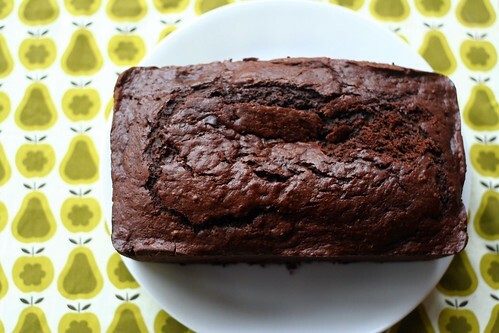 This is inspiring me to dig out my old recipe for choclate banana bread - I have the ripe bananas sitting here on the counter. Do you want to kiss Target for carrying Orla Kiely tablecloths and prints like me?? Hi! I found this post via a google search on the coco-nana bread recipe. I made it last night and had the same exact experience you did--including the "disgusting" first taste (and the messed-up top where it touched the aluminum foil "tent"!). I also had to bake it 20 minutes longer than what the recipe said. It was particularly disappointing because everything else I've ever made from this cookbook has been excellent. The only "change" I made was to use chocolate chunks instead of chocolate chips. I do like the texture of the chocolate chunks. Oh, man. Chocolate plus bananas plus buttermilk? I think this is the end-all be-all banana bread. I totally agree with the change in flavor issue. I thought they were MUCH better out of the refrigerator. Something about mellowing the chocolate and banana. I just made this recipe last night, also found it disappointing and decided to google it this morning to see if I was the only one that didn't like it, or if I did something wrong. Yours was one of a bunch of reviews that seemed less than excited about it. I had the same experience as you: took a bite when it was hot and thought it was terrible; it got better later but not good enough to be worth the calories! Lovely blog, by the way - I'm glad I came across it! You take gorgeous photos. Thanks for your honest review. I was about to make it until I saw your post and now I think I'll just make my super easy one bowl, tried and tested and love it banana bread and add some chocolate chips. SO, I made muffins instead of bread, baked for 20 minutes. Used three bananas instead of two splashed with a little vanilla. Substituted the sugar amounts for 1/2 cup of each. No chocolate chunks at all. Delicious.